Seemingly overnight, Austin was buzzing with electric scooters last month. Scooter riders weaved through crowded sidewalks and traffic downtown and zoomed out of drivers’ blind spots near the University of Texas campus, catching motorists and pedestrians alike off guard. Bird Rides, a dockless scooter company, deployed a fleet of thin, black scooters in April that quickly grew to almost 700. Then came LimeBike, which flooded the streets with their own white and green Lime-S scooter models on April 16. Then, just as quickly, they disappeared last weekend. The appearance of rentable scooters across the city briefly threw Austin’s political leaders into a frenzy as city government officials rushed to roll out a plan to regulate the businesses, which had started operating before a city-led pilot program could begin. “In order to forestall a predictable and unmanageable swamping of our streets with thousands of vehicles, ATD recommends a more nimble response than our previously expressed pilot timeframe,” Robert Spillar, director of the Austin Transportation Department, said in a letter to the mayor and Austin City Council members. The council worked until after 2 a.m. Friday to change city code and prohibit leaving dockless scooters or bicycles on city sidewalks and streets until a permitting process begins. Violators can have their scooters impounded and face a $200 fine for each seized scooter. Over the weekend, both California-based companies pulled their vehicles from Austin city streets — but not before the city’s transportation department impounded about 70 of them. “We expect Birds in Austin to be back on the streets within a few days,” company spokesperson Kenneth Baer said. “From the beginning we have respected the rule of law and we will not operate outside the boundaries of the ordinance just passed." Mary Caroline Pruitt, LimeBike’s communications manager, said the company applauds the city for setting up a permitting process and hopes to deploy a range of vehicles to Austin streets shortly. Along with scooters, it wants to rent both regular and electric-assisted bicycles. “We express our sincerest apologies to our riders for the inconvenience and look forward to deploying a multi-modal fleet later this week,” Pruitt said in a written statement. Both companies placed their scooters on sidewalks and street corners throughout the city. Customers could download a smartphone app that allowed them to see the vehicles' locations in real time, unlock them and pay the rental fee. Both Bird and Lime-S charge a base fee of one dollar, then 15 cents per minute of use. Austin initially planned to begin a pilot program for what it calls “dockless mobility” — meaning vehicles that aren’t kept in racks or docking stations — starting May 1, but Bird and LimeBike deployed their scooters before it went into effect. So the city pivoted to the new permitting process, which will require a $30 fee for each vehicle and cap the initial number of vehicles per licensed operator at 500. The city plans to roll out the new process shortly. And not a minute too soon: The Austin Transportation Department said it’s coordinating with 15 different dockless mobility companies that have expressed interest in coming to Austin. GOAT, an Austin-based dockless scooter company, said it was penalized for waiting for Austin to deploy its pilot program. 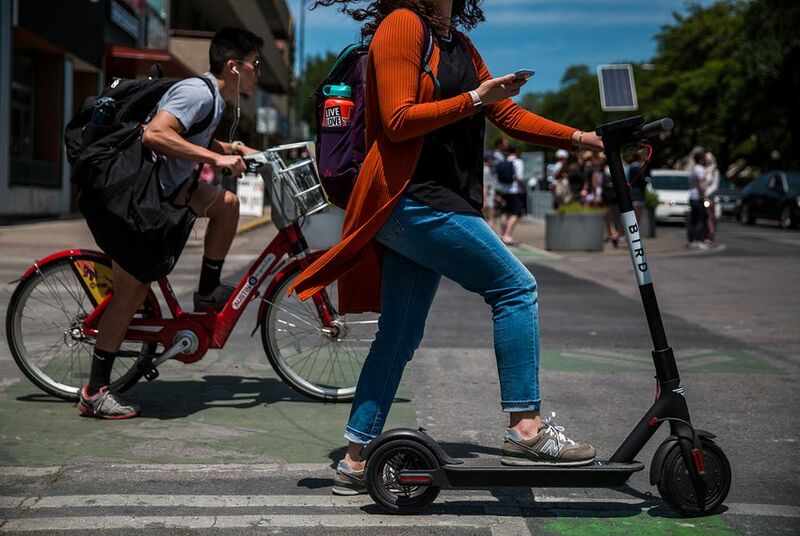 David Estrada, Bird’s chief legal officer, said the company is most worried about having to scale back the number of scooters it has on Austin streets. In order for the company to have 500 scooters available at any given time, Estrada said it would have to have many more in circulation because of the charging process, which requires a network of people who are paid to collect and recharge the scooters when their batteries run low. Estrada said the company chose Austin for expansion because it’s a leading tech city and because of its well-documented traffic congestion. He said Bird is trying to help solve what it calls the “last-mile problem” — how people can get from a bus or commuter train to their final destination when it’s too far to walk. Frank Westmoreland, a freshman at the University of Texas at Austin, said he loved being able to take the scooters to and from his classes. While the scooters have been criticized for littering city streets, Westmoreland said since they were first deployed he hasn’t noticed them being much of a problem. “I think the university is taking good steps to encourage students to park them near bike racks,” Westmoreland said. Past Austin ordinances regulating companies in the sharing economy have come under fire by the Texas Legislature. In 2016, Austin attempted to mandate transportation network companies, such as Uber and Lyft, comply with stricter background check requirements, only to see lawmakers overrule those requirements — part of a series of local control battles between the city and the state. Jen Samp, a spokeswoman for the city's transportation department, said Austin is focusing on improving safety, not on another potential battle with the Legislature. The situation in Austin echoes a debate over bike sharing companies that has been playing out in Dallas for months, after several companies entered the North Texas market last year with bikes that can be rented — and dropped off — just about anywhere. That led to complaints from residents that the bikes were blocking sidewalks — and in some cases being flung into front yards, trees and even in the Trinity River. City officials have told the companies to keep better track of their fleets, but the city council last month balked at the idea of charging fees that they feared could chase the companies out of the city. Brandon Formby contributed to this story.